Discover the major sites of Paris with your driver-guide: Notre-Dame Cathedral, the Eiffel Tower and Montmartre. 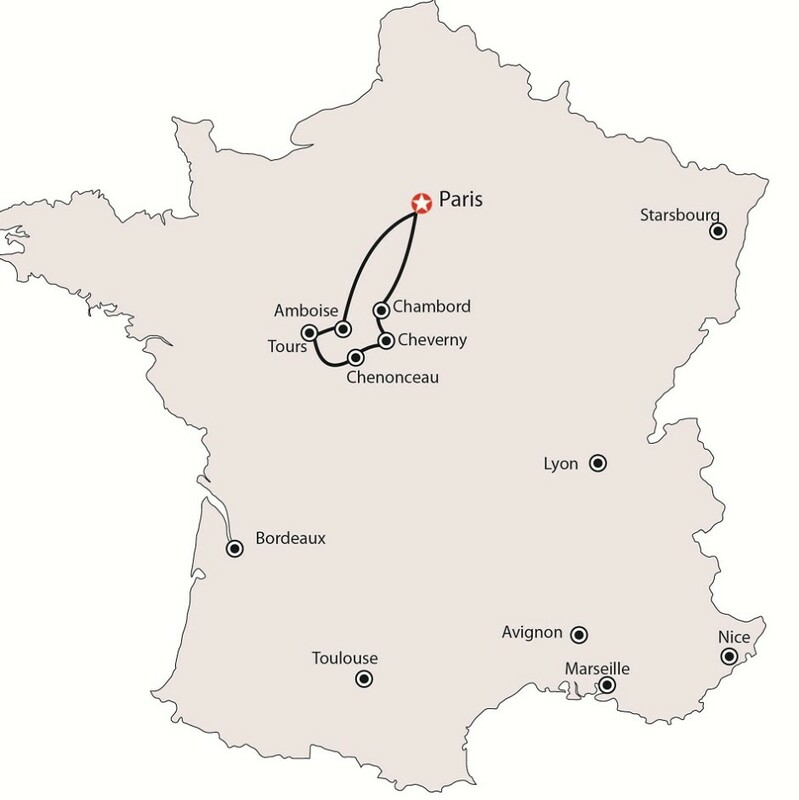 Route: Concorde Square – Louvre Museum – Seine River and its bridges – French Academy – Cité Island with the Palace of Justice and Notre-Dame Cathedral (stop and free time) Hôtel de Ville (City Hall) – the Latin Quarter with the Sorbonne and the Pantheon of famous French Men – Arch of Triumph – Champs-Elysées Avenue – Eiffel Tower (photo-stop) – Invalides with the dome of Napoleon’s tomb – Opera House. Free time in Montmartre, stop near the basilica of Sacre Coeur and the artists’ square, Place du Tertre. We begin by crossing the southern districts of Paris to take the Aquitaine motorway. A guided visit of the Amboise Castle overlooking the Loire River offers an excellent introduction to the history of the region. Free time will be allocated for lunch. Our afternoon continues with a guided visit of Clos-Lucé (Leonardo de Vinci ‘s last dwelling) and the gardens of Villandry. Dinner and accommodation at the hotel Mercure Tours Nord 3* (or similar). Departure for Chenonceau for a guided visit of the castle. We continue our morning with a guided visit of the Château de Cheverny followed by lunch at the Hotel Saint-Hubert (regional restaurant of rustic style). Our stay in the Loire Valley ends with a guided visit of the royal Château de Chambord.